Cardiovascular disease (CVD) is responsible for high morbidity and mortality in Brazil; the 40% reduction of age-standardised mortality observed over the past three decades has been unequal and considerably less pronounced in low-income regions.1 These underserved populations often suffer long delays in diagnosis and referrals for specialised care, resulting in premature morbidity and mortality.1–3 The burden of CVD is affected by the high prevalence of rheumatic heart disease (RHD), still responsible for a great proportion of heart surgeries in adults.4 The considerable prevalence of subclinical disease5 suggests that strategies to detect its late sequelae in adults from low-resourced areas should be prioritised. The implementation of the Brazilian public health system (SUS) in the 1990s introduced a integrative approach to deliver primary care through community health agents—members of the population responsible for health promotion in a defined population or area—a potential platform for the implementation of preventive interventions.6 With the development of handheld echocardiography and internet-based telemedicine solutions—both of which have been demonstrated in Brazil7—integration of screening strategies for CVD with the pre-existing public health system may be a future direction for early diagnosis and prioritisation of care in underserved areas. In this study, we aimed to evaluate the feasibility of integrating screening echocardiography (echo) in the established primary care system (PC) coupled with remote telemedicine interpretation at a tertiary centre. 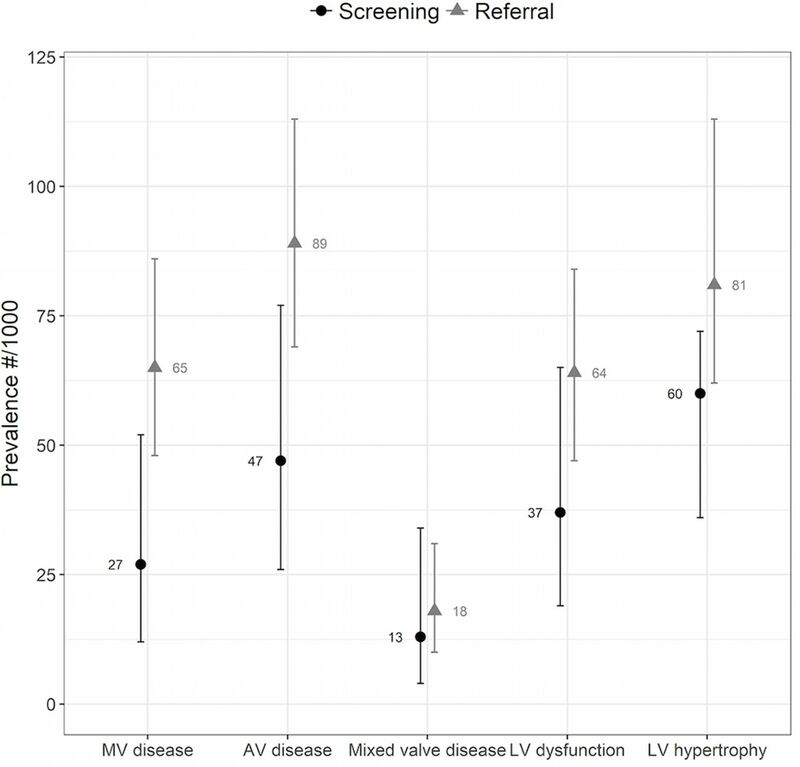 We further characterised prevalence of significant heart disease (HD) in screened populations and compared this to those with referral for echocardiography for clinical indication. The Programa de Rastreament O da VAlvopatia Reumática (PROVAR)+ study is a continuation of the RHD screening programme established in 2014, as a collaboration between the Universidade Federal de Minas Gerais, Telehealth Network of Minas Gerais8 and the Children’s National Health System, Washington, DC, USA. The study took place between January and December 2017 in two cities of the southeastern state of Minas Gerais: Nova Lima (central area, 87.4 thousand inhabitants) and Montes Claros (north, 361.9 thousand inhabitants). Ethics approval was obtained from the institutional review boards of the participant institutions and from the state and city Boards of Health. The PROVAR+ study uses non-experts for image acquisition, on handheld (VScan, GE Healthcare, Milwaukee, Wisconsin, USA) devices, for echocardiographic detection of HD in the PC setting, and telemedicine interpretation by experts in Brazil and the USA, according to the American Society of Echocardiography (ASE)9 criteria. PC centres were enrolled according to the priorities of Health authorities, based on low socioeconomic indexes—considering the local Human Development Index—and limited access to secondary and tertiary cardiovascular care. In the 3-month implementation and training phases, 20 healthcare workers (four physicians, four nurses and 12 technicians) at 16 PC centres (two in Nova Lima and 14 in Montes Claros) (figure 1) received an educational curriculum on echocardiography, consisting of nine online modules http://www.wiredhealthresources.net/EchoProject/index.html and were trained on simplified echo protocols, utilising handheld machines, totalling at least 32 hours of hands-on practice. Additionally, four previously trained non-physicians (2 nurses and two technicians) with 2 years expertise were integrated into the PC centres to optimise screening efficiency. Community health agents were trained to provide house-to-house education about HD during regular visits, using educational printed brochures and tablet computers with animated slides and a video. Group education (‘operative groups’) was also provided on a regular basis. Any person attending the facility who met the inclusion criteria was also informed of the programme, and informed consents were actively collected during visits, group activities or prior to the echo (figure 2). 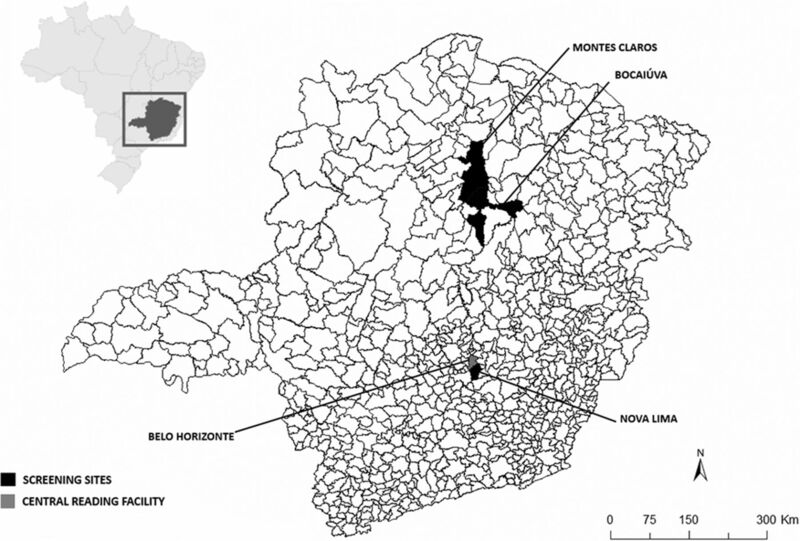 Map showing the location of the screening sites in black (Nova Lima, Montes Claros and Bocaiúva (Montes Claros metropolitan area)) and of the central reading facility in grey (Belo Horizonte, Telehealth Centre, Hospital das Clínicas da Universidade Federal de Minas Gerais). The second reading centre is located at the Children’s National Health System, Washington, DC, USA. Flow chart of the Programa de RastreamentO da VAlvopatia Reumática (PROVAR)+ study. CNHS, Children’s National Health System; RHD, rheumatic heart disease; UFMG, Universidade Federal de Minas Gerais. As the educational curriculum was delivered, consecutive patients were invited to participate according to the inclusion criteria: (1) screening (SC) population: all asymptomatic patients in three age groups (17–20, 35–40 and 60–65 years), without previously known significant HD or formal indication or referral for regular echocardiography (Belo Horizonte); (2) referred (RF) population: patients in the system’s waiting list for a regular echocardiogram or patients referred by the PC physician to the PROVAR+ programme for clinical indications (Belo Horizonte and Montes Claros). 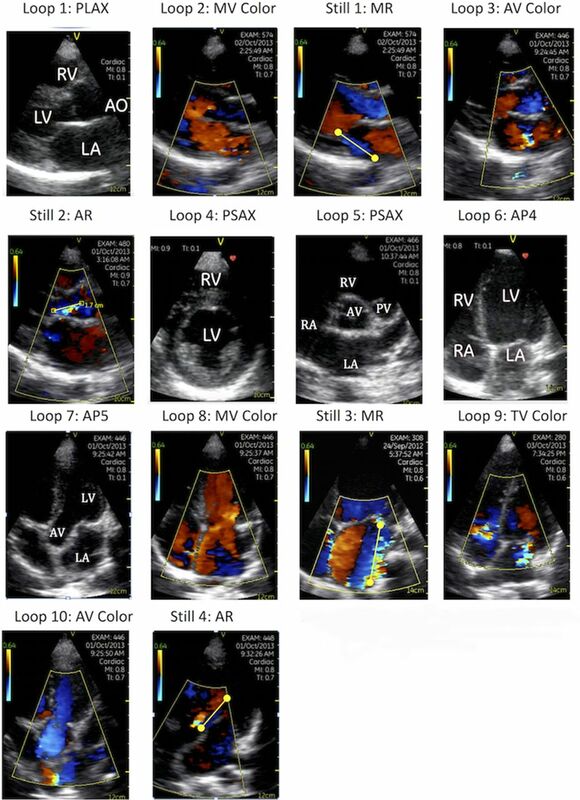 Eligible patients answered a brief standardised clinical and sociodemographic questionnaire and underwent the simplified seven-view echocardiographic protocol focusing on mitral, aortic and tricuspid valves, left and right ventricular morphology and function and pericardial effusion (figure 3) utilising handheld devices (VScan). The ASE diagnostic criteria10 were applied, modified for handheld devices in the absence of spectral Doppler. Objective measurements and subjective observations were reported. Significant HD was defined as moderate to severe valve disease (regurgitation or stenosis), ventricular dysfunction/hypertrophy, congenital heart disease, pericardial effusion or any wall-motion abnormalities, based on the ASE-Remote Echocardiography with Web-Based Assessments for Referrals at a Distance study criteria9 (online appendix table 1). Simplified screening protocol for handheld devices for evaluation of heart diseases in adults, consisting of 14 images (seven views): 10 loops and four still frames. AP4, apical four chambers; AP5, apical five chambers; AV, aortic valve; AR, aortic regurgitation; LA, left atrium; LV, left ventricle; MR, mitral regurgitation; MV, mitral valve; PLAX, parasternal long axis; PSAX, parasternal short axis; RA, right atrium; RV, right ventricle; TV, tricuspid valve. A cloud computing environment (SigTel, Universidade Federal de Minas Gerais, Belo Horizonte, MG, Brazil) for online storage and reporting was developed, and proprietary offline software for VScan files were used for telemedicine interpretation (subjective evaluation and objective measurements) in Brazil and the USA.11 Screen-positive cases were reviewed by two experts (Brazil: MN and USA: CS and AT) and discrepancies were consensually solved. All reports were made available online for the PC centres. A regular echocardiogram was scheduled for all patients with confirmed significant abnormalities in the final conclusion and at the discretion of the expert reader for those not fulfilling these criteria—provided in the PC centre within 60 days by experts from UFMG with portable machines (Vivid IQ, GE Healthcare), as well as referral to the university hospital or local cardiology facilities for clinical follow-up. Continuing care was left to the discretion of the attending cardiologist (figure 2). Data were entered to the SigTel system and exported to the RedCap database.12 Statistical analysis was performed using SPSS software V.23.0 for Mac OSX. As this was an exploratory study, no prespecified sample size calculation was performed, and we considered the total sample enrolled in 11 months. Categorical variables, expressed as numbers and percentages, were compared between groups (SC and RF) using Fisher’s exact test, whereas continuous data, expressed as mean±SD or median or Q1/Q3 (25%/75%), were compared using Student’s unpaired t-test or the Mann-Whitney U test, as appropriate. Separate analyses of prevalence by age groups were performed. A random sample of 85 initial follow-up echocardiograms was selected to evaluate the agreement with handheld examinations for the presence of significant HD. Bivariate logistic regression was used to look for individual predictors of significant HD (in the overall population, SC and RF groups), and factors that were significant at p<0.10 were put into multivariable models. Demographic and clinical variables as well as cardiovascular symptoms and previous referral for echocardiography were evaluated. We further assessed the interaction between age and indication for echo in the model for the overall population. A two-tailed significance level of 0.05 was considered. All healthcare workers completed the online modules and hands-on training. The educational curriculum was delivered to 3500 community members (approximately 1000 families) and 1004 were enrolled; 299 (29.8%) in the SC group and 705 (70.2%) in the RF group. All patients in the SC group and 47.9% in the RF group were from Nova Lima. Mean age was 51±18 years, 63.9% were females. The average waiting time for a regular echo was 180 days in Nova Lima and 540 days in Montes Claros. Demographic and clinical characteristics of the groups are in table 1: the RF population was older (p<0.001) and had greater proportions of hypertension (p<0.001) and history of peripheral artery disease (p=0.009) and stroke (p=0.02). The most frequent symptoms reported were chest pain (24.4%), dyspnoea (19.3%) and palpitations (16.1%), more prevalent in the RF group (table 1). Despite the absence of previously reported cardiovascular symptoms, 23.1% of the patients in the SC population had some complaint, contrasting with 42.7% in the RF group. The remaining patients in the RF group were referred for other observations in physical examination, medical history and complimentary tests. After the quality assurance phase, none of the examinations were considered non-interpretable. However, specific issues were reported: limited overall quality (n=35, 3.4%), limited evaluation of the left ventricle (LV) (n=15, 1.5%), aortic valve (n=2, 0.2%), mitral valve (n=2, 0.2%) and right ventricle (RV) or tricuspid valve (n=4, 0.4%), totalling 5.8% of the examinations. The main echocardiographic abnormalities observed in the SC and RF groups are detailed in table 2. Overall, significant HD was found in 354 (35.3%) patients (23.4% in SC vs 40.3% in RF group, p<0.001). Despite anticipated higher prevalence of abnormalities in the RF group, a significant burden of valve disease and LV involvement was observed in the SC population (table 2). Findings suggestive of RHD were observed in 2.0% of the patients in the SC group versus 2.3% in the RF group (p=0.80). Figure 4 shows the rates of major HD requiring clinical referral, in the SC versus RF groups. Among those, severe valvar regurgitation requiring immediate clinical attention was observed in 0.7% (n=2) versus 2.4% (n=17), p=0.08, and severe LV hypertrophy or dysfunction in 2.3% (n=7) versus 3.1% (n=22), p=0.68. Among patients with ventricular hypertrophy or dysfunction, 76.4% had hypertension. Echocardiographic prevalence of major heart disease requiring priority referral based on the final conclusion of the expert readers, according to study group. AV, aortic valve; LV, left ventricle; MV, mitral valve. The analysis by age groups (figure 5) showed that the difference between SC and RF groups was mostly driven by the higher prevalence of significant HD in patients aged >65 years, not included in screening. In the other ages, prevalence was similar, and the overall rates excluding the older RF group were comparable, although still statistically different (SC: 23.4%, 95% CI 17.6 to 27.4 vs RF: 29.8%, 95% CI 25.0 to 33.1, p=0.038). Prevalence was higher in patients in the SC group aged 60–65 years compared with the younger groups (p=0.012) and, compared with the patients in the RF group matching the screening age ranges, prevalence was statistically similar in those with 17–20 years (14.9% vs 25.0%, p=0.50) and 35–40 years (16.5% vs 19.0%, p=0.75) but lower in the older group (29.2% vs 50.8%, p=0.008). 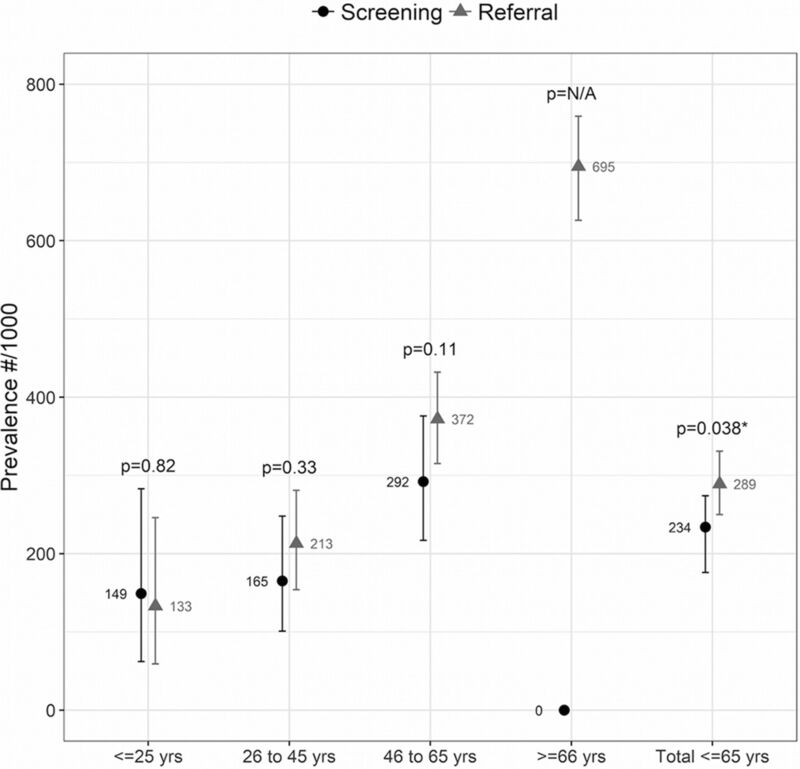 Prevalence of significant heart disease by age groups in screening and referred populations. In the sample of follow-up echocardiograms, agreement with screening echos for the presence of any significant HD was observed in 78.8% (n=67) of the cases. Major issues in screening accounting for disagreement were: overestimation of regurgitation jets (n=9), overestimation of LV dysfunction (n=8) and overestimation of LV hypertrophy (n=5). Table 3 shows the variables associated with significant HD in the overall population and in the SC and RF groups in bivariate regression analyses. In multivariable analyses, age significantly interacted with indication (previous referral for echo) in the overall population: OR 1.30, 95% CI 1.07 to 1.59, p=0.008. However, the magnitude and direction of the association between age and HD did not differ between groups: age (OR 1.31) was the only independent predictor in the SC population and age (OR 1.63) and hypertension (OR 1.56) were the predictors in the RF group (table 3). Data from over 1000 handheld echocardiograms performed in the Brazilian PC system suggests the feasibility of the strategy. Task shifting to non-physicians and remote interpretation by the established telemedicine network provided cardiovascular diagnosis to underserved areas. A considerable burden of significant HD was observed, with high rates even in the SC population, highlighting the need for further exploration of this model. A wide disparity of health resources exists in the Brazilian territory—as in other low-income and middle-income countries9—with concentration in large cities and metropolitan areas. Even within these urban settings, there are foci of highly vulnerable areas, where task shifting for community healthworkers is crucial. Thus, data on the feasibility and applicability of such approach are fundamental for policymaking, since non-physicians are not allowed to acquire echocardiographic images outside research protocols according to Brazilian regulations. The burden of HD was beyond expected, especially in the SC population, and likely reflects CVD epidemiology in Brazil. Although the country experienced the epidemiological transition in the 1960s, the burden of cardiac involvement by infectious diseases—most notably RHD and Chagas disease5 20—is still high, and the burden is largely associated with late diagnosis.1 Our data resembles findings from a mass screening in rural India, with an interpretation flow chart similar to PROVAR+, showing alarming rate of 16% of significant abnormalities (32.9% valve disease) with an important contribution of RHD.9 It is also remarkable that the ageing of the Brazilian population is progressively impacting the burden of degenerative valve disease and other cardiovascular conditions associated with chronic diseases such as hypertension and diabetes.1 Our choice for the three age groups for screening aimed to capture such epidemiological features. In general, the findings were aligned with these demographic and clinical characteristics, with ventricular involvement and degenerative valve disease being more frequent in older groups, with more risk factors and other abnormalities—as mitral valve prolapse and RHD—in younger adults. Furthermore, our data suggests the greatest utility of systematic screening in older (60–65 years) patients—who could have presumably been diagnosed by screening programmes when they were younger—or possibly in younger groups in RHD endemic regions (in which more focused protocols can be applied). On the other hand, follow-up echo was not indicated for a considerable proportion of the RF population (60%)—with previous indication for regular echocardiography. This is similar to previous data, in which a 68% decrease of indications of conventional echocardiography was achieved through handheld echocardiography in PC.17 These data suggest task sharing of echocardiography in the PC system may both be cost-saving and optimise resource utilisation by decreasing unnecessary referrals and prioritising high-risk patients. Interestingly, clinical variables seem to help recognise those with significant abnormalities among the RF group, but not for the mostly asymptomatic SC group, leading to the hypothesis that simplified echo in the PC centre may be even more useful for patients in the waiting list with some clinical features. Finally, the educational curriculum of the PROVAR+ study was a crucial step to improve population awareness about CVD and to improve participation of the target populations. Health promotion through community health agents allows a closer interaction, favouring the evaluation of community needs and preventive interventions.6 The features of our approach are aligned with demands of public underfunded health systems in several ways: (1) handheld echocardiography is unexpensive and may be practical for community-wide approaches; (2) the overall strategy seems to be feasible, with good acceptability; (3) telemedicine was effective for practical file sharing and remote reporting, improving coverage; (4) task shifting to PC staff seems to be effective, presumably saving costs, increasing availability and resulting in good quality imaging; (5) populations may benefit from both 1 (early diagnosis in high-risk screening populations) and 2 (rationalisation and prioritisation of referrals). Thus, integration of echocardiography screening as a novel preventive strategy for existing health systems may be a future direction and deserves further evaluation in different settings. Based on our findings, in Brazil, the strategy may be implemented for older schoolchildren (14–18 years) for adequate identification and follow-up of subclinical RHD, for adults ≥60 years, especially in the presence of cardiovascular risk factors, for timely diagnosis of missing HD and for patients experiencing long waiting lines for regular echocardiography, as a prioritisation tool. Efforts should be focused on the lowest income areas. Our study has several limitations, mostly related to handheld echocardiography itself. First, despite the advances of handheld devices and their applicability in several scenarios, issues as the lack of spectral Doppler, the impossibility to adjust colour Doppler settings and the limited definition may impact accuracy, sometimes overestimating the presence and length of regurgitant jets,21 as observed in our comparison with standard echocardiography. Second, follow-up confirmatory echos were not yet available for all positive patients, limiting inferences about the agreement with a ‘gold standard’. Although the accuracy of handheld devices compared with regular echocardiography has been demonstrated in other screening strategies,7 prevalence may be biased upwards and more definitive agreement data will be warranted in the near future. Third, participation in some subareas—especially the poorest neighbourhoods—was suboptimal, what may be an additional confounder. Fourth, no population stratified sampling procedures were performed, limiting the extrapolation of prevalence. Fifth, the study was conducted in specific low-resourced areas of the state of Minas Gerais and the findings cannot be directly extrapolated to the entire country. Despite these limitations, to the best of our knowledge, this is the first large-scale programme designed to evaluate the integration of screening echocardiography in the existing PC system in Brazil. The results point towards the feasibility of the incorporation of the strategy, but further investigations are needed. Integration of screening echo into PC seems to be feasible in Brazil as a strategy to deliver cardiovascular care to low-resourced areas through task shifting, taking advantage of the pre-established PC system. The considerable burden of significant HD observed suggests this tool may improve early diagnosis and referral, presumably serving as a prioritisation tool. The prevalence in SC populations was especially high, suggesting the importance of the systematic evaluation of asymptomatic patients in underserved areas, where the burden of HD may be higher. The burden of heart disease is important in Brazil, being associated with high morbidity and mortality. Advances in handheld echocardiography and telemedicine in the past decade, with affordable and simple devices, task shifting and remote interpretation may improve access to cardiovascular care to underserved populations. 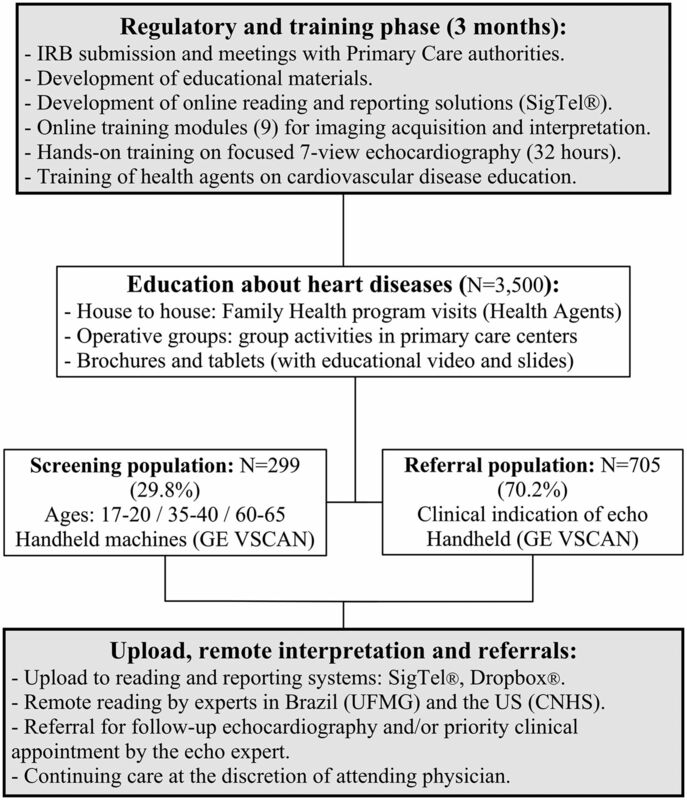 The novel integration of handheld echocardiography with remote interpretation by telemedicine seems to be feasible in low-income areas in Brazil. The burden of heart disease observed was considerably high, even in patients without previously known disease, being higher in older age groups. Also, more than a half of the patients waiting for a regular echocardiogram did not have significant heart disease and/or indication for priority referrals. Handheld echocardiography may be further evaluated by health policymakers as a tool for both early diagnosis of cardiovascular disease and prioritisation of referrals and optimisation of the use of health resources in underserved areas. The PROVAR investigators would like to thank Edwards Lifesciences Foundation for supporting and funding the primary care screening program (PROVAR+) in Brazil, General Electric Healthcare for providing echocardiography equipment and WiRed Health Resources for providing online curriculum on heart disease and echocardiography. American Society of Echocardiography (ASE) Guidelines. Echocardiography ASo, ASE Guidelines. Durham - NC: ASE, 2018.
. Cost-benefit of the telecardiology service in the state of Minas Gerais: Minas Telecardio Project. Arq Bras Cardiol 2011;97:307–16.